In 1940, after tearing through Western Europe in a dazzling series of victories, the seemingly unstoppable Nazis were poised to take England. But Hitler could not cross the English Channel without undisputed control of the skies. The Germans would use the Luftwaffe, battle-tested in the Spanish Civil War and the blitzkrieg victories in Czechoslovakia, Poland, Belgium, and France, experienced and deadly. The British would defend themselves with the Royal Air Force, plus the grit and determination of over a million civilians who pitched in and served in the Home Guard, Observer Corps, and as firemen, rescue workers, ambulance drivers, and more. Their Finest Hour is a complete roleplaying sourcebook for one of the most inspiring episodes in all of World War II. 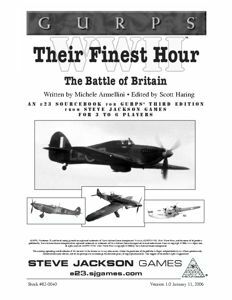 A complete history of the campaign kicks off the sourcebook, followed by suggestions on the many kinds of characters you can play in a Battle of Britain game, complete stats on aircraft that flew in the battle that have not been covered in previous GURPS WWII releases, and an entire chapter of campaign and adventure ideas – plus ideas for where to send veterans of the campaign after the Battle of Britain is over!